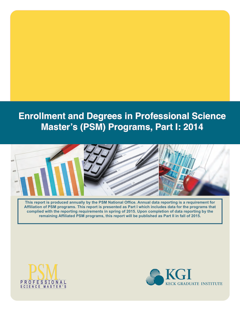 The 2014 Professional Science Master’s Enrollment and Degrees Survey collects data on overall enrollment and degrees awarded in Professional Science Master’s (PSM) programs. This is the first survey of PSM enrollment and degrees administered by the PSM National Office at KGI. The survey asked questions related to 1) institution and program, 2) a total number of applications, 3) first-time enrollment during the Fall 2014 term, 4) total enrollment in Fall of 2014, and 5) degrees awarded during the academic year 2013-2014. As the next step of our PSM program assessment, this survey will continue by collecting data from the remaining half of the institutions to hopefully capture at least a 90% response rate of the entire PSM program’s data, which will provide more beneficial data for institutions planning to develop more PSM programs nationally and internationally.